If you have 29 million pesos to spare you can have this house. It's located at the famous Mckinley Hill Village. Click "Read More" to take a peek at the house and a little gossip. 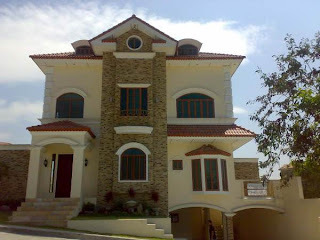 One of the houses in Mckinley Hill Village is owned by a European guy and a young Filipina, a couple. The European guy went shopping one day about 2 years ago at SM Megamall and saw this salesgirl, invited her out, got enamoured, and the rest was history. They got married the same year and he put up this house for her. O di ba, McKinley Hill pa? Talk about prince charming. Hehehe. And they have many Getz mini cars for the rest of the bride's family.